Well, the blog is back just in time for me to post a story… which is annoying as it would be nice to have a week off without having to fabricate a story for Mike and Corey to cover my bone idle nature. Sadly, the downtime means that the usual post crafting process got slightly short-circuited this week. Usually posts take days to carve out of the blank page, with multiple reviews by my army of copy editors and fact checkers, a couple of hours down at the library leafing through historical documents to verify seemingly insignificant points, and most importantly an editorial and content review by Corey and Mike to make sure I’m not making them look bad (or inserting too many unnecessary albatrosses in my posts). Honestly, it amazes me I have any time to bird at all. So this week, should you stop a mistake, or a minor factual inaccuracy, or even a complete bare-faced lie, well, it isn’t my fault. Anyway, hornbills. Hornbills are fantastic birds that have fascinated me since I was able to leaf through the big and lavishly drawn Birds, their Life, their Ways, Their World, that was one of my favorite non-dinosaur (or so I thought at the time) books of my childhood (the other was the twin set mammals of the world by National Geographic). 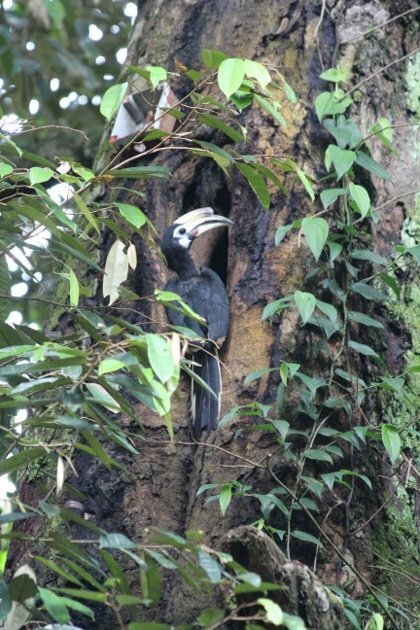 Okay, they weren’t as fascinating as the birds of prey eating their, or the frankly still weird drawings of nightjars carrying eggs and woodcocks carrying chicks, but still, hornbills were cool because they sealed their mates up in holes in trees and then fed them as they raised the chick. That, and they looked kind of like toucans, but they weren’t. And I liked toucans, so clearly hornbills were on to a winning look, in fact, as a child it was hornbills, toucans and parrots that I associated the tropics with. I still like hornbills, and have been luck to see many different kinds of hornbill around the world. 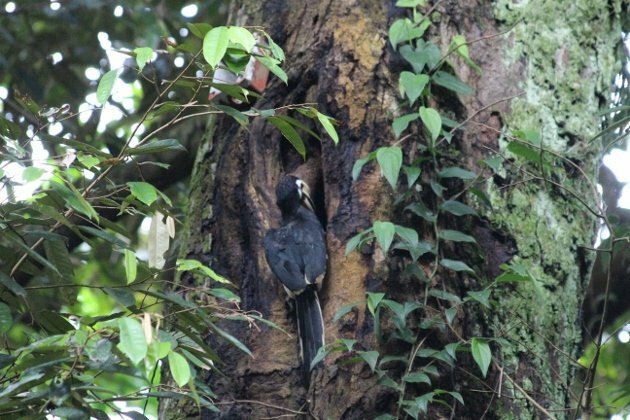 One of my most cherished birding sightings in Uganda was seeing a distant male hornbill land by a walled up hole in a tree and feed its mate. It was as if my childhood book had sprung to life. Then, on a recent visit to Pulau Ubin in Singapore, I actually managed to get a few shots of a pair of Oriental Pied Hornbills checking out a potential nesting hole in a massive tree. The Oriental Pied Hornbills are pretty special, as they represent a recolonization of Singapore of this family. Singapore lost a lot of birds during its urbanisation, but as the city has tried to green itself some have been coming back Pulau Ubin is a lovely undeveloped island near Malaysia with lots of forest left, and having made it here the hornbills have also begun to be seen on the main island of Singapore too. I saw a pair flying near Chiangi Beach, across from Pulau Ubin and near the famous airport. 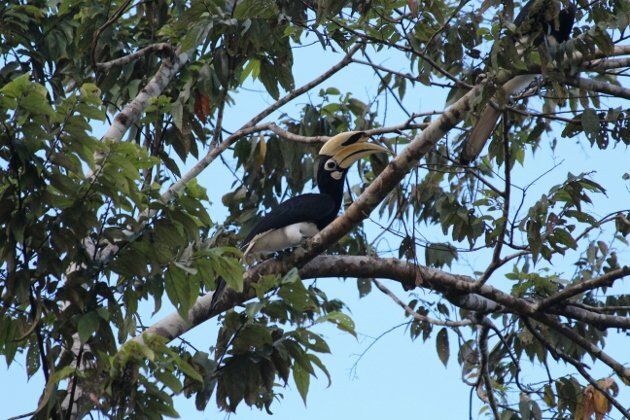 As Singapore continues to green will hornbills continue to spread back through the city? We can hope! Hornbills were at the top of my wishlist on my first birding trip to Asia. Somehow, we didn’t spot a single one in Malaysia’s Panti Forest, but luckily Changi Beach delivered. Watching these hornbills terrorize the parrot flocks was a major treat! 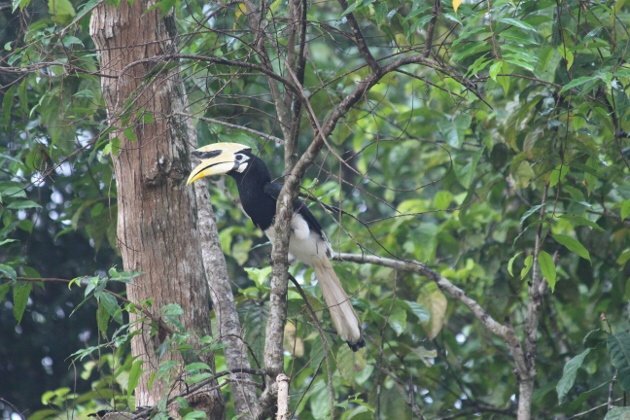 Hi Duncan, I have found OP Hornbills at Bukit Timah and Sungei Buloh on Singapore. They featured as my BBOTY for stopping to preen within a few feet of my camera.